U2 singer Bono (center left) smiles while he, his sons and bandmate The Edge (with phone) speak to astronauts aboard the International Space Station on Oct. 13, 2009 during the Expedition 21 mission. As if being an astronaut wasn't already a dream job, addpersonal calls from the band U2 to the list of perks in space. 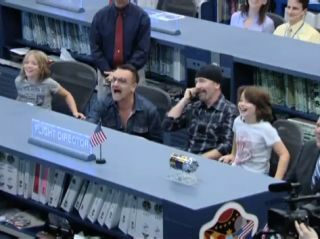 U2 members Bono and The Edge, along with Bono's sons Eli andJohn, stopped by NASA?s Johnson Space Center in Houston Tuesday to call up tothe spaceflyers on the InternationalSpace Station. "We've had our breath taken away this morning to be ledin here into this place," Bono told the astronauts. "It is an amazingchurch of possibilities. We're here to pay homage." The group made the stop while in town for their plannedconcert Wednesday at Houston's Reliant Stadium. They spoketo station commander FrankDe Winne of Belgium, NASA astronauts Nicole Stott and Jeff Williams, andRussian cosmonauts Maxim Suraev and Roman Romanenko. Joining in on the call via another phone was Guy Laliberte,a Canadian space tourist who landedSunday in Kazakhstan after an 11-day stint in space. "Hey Guy, how you doin' buddy? This is Max, we missyou!" Suraev called. Laliberte said he missed everybody on the space station too,and is still adjusting to life back on Earth. "There's a part of me that stays in space and willprobably stay forever there," he said. "I can't leave such abeautiful environment totally." Laliberte, the billionaire founder of Cirque du Soleil, isalso a friend of Bono and The Edge?s, and collaborated with them and otherartists last week on aperformance from Earth and space to advocate for water conservation. "You're the first artist in space and that's an amazingthing," Bono told Laliberte. In reference to Laliberte's visit, Bono asked theastronauts, "Was it different having an artist rather than an engineer ora scientist with you?" "It was for sure different to have an artist up here,"De Winne responded. "Guy was a big professional up here. He did very well,we all enjoyed it terribly. We don?t usually run around in red noses, so it wasa change for us for sure." While Laliberte was on the station he sported his signaturered clown nose, and even brought one for each of his co-spaceflyers to wear. One of the most visibly excited astronauts to speak to theU2 musicians was Romanenko, a second-generation cosmonaut who eagerlyintroduced himself to Bono and The Edge. "I'm very familiar with your art and I'm lookingforward to take part next year in Moscow in your performance," he said. "How'bout one song with you guys?" "How's your guitar playing, Roman?" The Edge asked. De Winne vouched for him. "Roman is a very good singerand he also plays guitar," he said. "If he can perform on stage inMoscow, I will for sure come and watch him." The band members seemed open to the possibility. Bono calledRomanenko a "pop star in space," and he and The Edge said they'd tryto get him on stage in Moscow. Bono also said the band would give a shout-out to NicoleStott's husband and son, who planned to attend U2's Houston performance. The musicians and the boys had lots of questions for thespaceflyers. John, 8, asked if it's really possible to see the Great Wall ofChina from space, and when told yes, Bono chimed in, "What about our U2production?" De Winne assured him that with the more than 90 trucks theband probably had for the upcoming show in Houston, they would likely be ableto see it. Overall, everyone seemed thrilled with the conversation. "We're just trying to do a simple thing which is remindpeople back on Earth that the impossible is possible and that?s what yourcourage and your focus reminds us all," Bono told all the spaceflyers. Space.com senior writer Andrea Thompson contributed tothis report.